Datrend Systems Inc. introduces vPad-IN, the next generation infant incubator and infant radiant warmer testing system that meets the requirements of the IEC Standards for incubators (IEC 60601-2-19) and radiant warmers (IEC 60601-2-21). 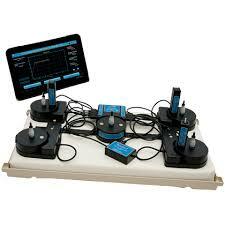 vPad-IN has all the functionality and scalability that you have come to expect from Vision Pad Technology products. Parameters are sensed inside the incubator environment and results are transmitted wirelessly to a 10″ Android tablet for analysis and display. Test parameters and test protocols can be modified without disturbing the equilibrium of the heated environment, thereby minimizing test times.